The 2B9 Vasilek (Cornflower) is an automatic 82 mm gun-mortar developed in the Soviet Union in 1967 and fielded with the Soviet Army in 1970. It was based on the F-82 automatic mortar. Unlike conventional mortars, the 2B9 can fire in single and automatic mode using four-round clips. Rounds can be loaded from either the muzzle or the breech. Because of its wheeled carriage, the 2B9 resembles a light artillery piece more than a conventional mortar. The 2B9 was used in Afghanistan by Soviet units and is still found in Russian airmobile infantry units. In the fighting in Afghanistan, Soviet units found the 2B9 to be a versatile and useful weapon. The 2B9 can fire high-explosive, armor-piercing and smoke shells, as well as flares. The armor-piercing projectile, which weighs 3.1 kg, has a 75 g warhead that can penetrate 100mm of armor. Upon blast, the shell[which?] produces 400 to 600 fragments. The 2B9 can be towed but is usually carried on a modified GAZ-66. By 1988, the 2B9 was also deployed as a self-propelled weapon by mounting the gun-mortar in the rear of an MT-LB armored personnel carrier. During the Syrian Civil War, the 2B9M Vasilek was used by the Syrian Armed Forces, Kurdish People's Protection Units, and the Islamist group Ansar al-Sham. The latter used a 2B9M automatic mortar near Mount Chalma, Kesab district. 2B9M Vasilek – Modernised version introduced in 1982, and adopted in 1983. DE-82 - upgraded Hungarian version developed in 1987. Type W99 – 2B9 Vasilek produced in the People's Republic of China by Norinco. Iraq – As for Saddam's era, often used mounted on MT-LB. Syria – Used by both government and rebel forces in the Syrian Civil War. 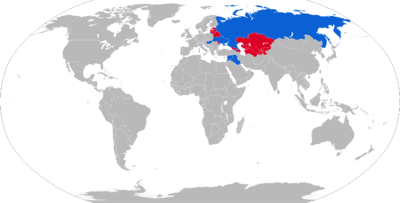 Soviet Union – Passed down to successor states. ^ Campbell, David (30 November 2017). Soviet Paratrooper vs Mujahideen Fighter: Afghanistan 1979–89. Combat 29. Osprey Publishing. p. 19. ISBN 9781472817648. ^ a b c d e f g h i Lovass, Ernő; Jenzen-Jones, N.R. (3 September 2018). "Soviet 2B9M Vasilek self-loading mortar". armamentresearch.com. ^ a b c Jenzen-Jones, N.R. ; Lyamin, Yuri (18 June 2014). "2B9M Vasilek automatic mortar in service with Ansar al-Sham in Syria". armamentresearch.com. ^ Blasko, Dennis J. (2013). The Chinese Army Today: Tradition and Transformation for the 21st Century. Routledge. p. 140. ISBN 9781136519970. ^ How the "Cornflower" fires 13/11/14. Novorossia TV. 13 November 2014. Retrieved 14 November 2014. Wikimedia Commons has media related to 2B9 Vasilek mortar.